Every year Leonardo DiCaprio gathers some of the richest, most glamorous, and smartest people in the world under a tent in Saint Tropez to celebrate the Leonardo DiCaprio Foundation’s mission of protecting the world’s last wild places. The Leonardo DiCaprio Foundation implements solutions that help restore balance to threatened ecosystems, ensuring the long-term health and well-being of all Earth’s inhabitants. Since that time the Leonardo DiCaprio Foundation was founded in 1998 it has continued has worked on some of the most pressing environmental issues of our day. In our world right now people who are fighting for our planet and keeping it sustainable to the planet sustained for our youngest generations and ones that have yet to be born. The money raised at this event will help fund these projects and it is drawing quite the crowd of international glitterati. We will see Lenny Kravitz perform in additions of Leo’s famous friends like Prince Albert of Monaco, Tom Hanks, Jared Leto, Tobey Maguire, and Edward Norton. Following are the lovely ladies who are expected to attend Leo’s Saint Tropez Gala and add high glamour to the red carpet. Cate Blanchett stared along side Leo, and won an Academy Award for her role, in The Aviator. Since then Cate and Leo have maintained a friendship and she is expected to support the Leonardo DiCaprio Foundation later this month at the Saint Tropez Gala. I am hoping that we see Cate on the red carpet since it has been a really long time since she has walked a red carpet. Cate opted to skip the 2017 Tony Awards where she was nominated last month. I would imagine that if Cate does step out that she will do so in high glamour and I think that this black Armani Prive Fall 2017 Couture gown which features a 3-D floral embroidered sheer long sleeve blouse and velvet column skirt would be a beautiful look for her to do so. I think that this gown evokes such glamour and I think that with an old Hollywood inspired updo, winged eye, red lip, diamond cluster earrings, black pumps, and a black clutch would ensure that this gown is a major moment for Cate’s return to the red carpet. Since her Oscar win earlier this year we have only seen Emma Stone on a red carpet once, at the AFI Tribute to Diane Keaton. Emma debuted the return of her bleach blonde locks and it made me sad. I love Emma as a redhead and I tend to find that when she is blonde that I don’t love as many of her red carpet looks. I hope that isn’t going to be the case as Emma gears up for a big movie tour this fall and into awards season next year. We will see if Emma is still blonde when she steps out for the Leonardo DiCaprio Foundation’s Saint Tropez Gala on Wednesday July 26, 2017. 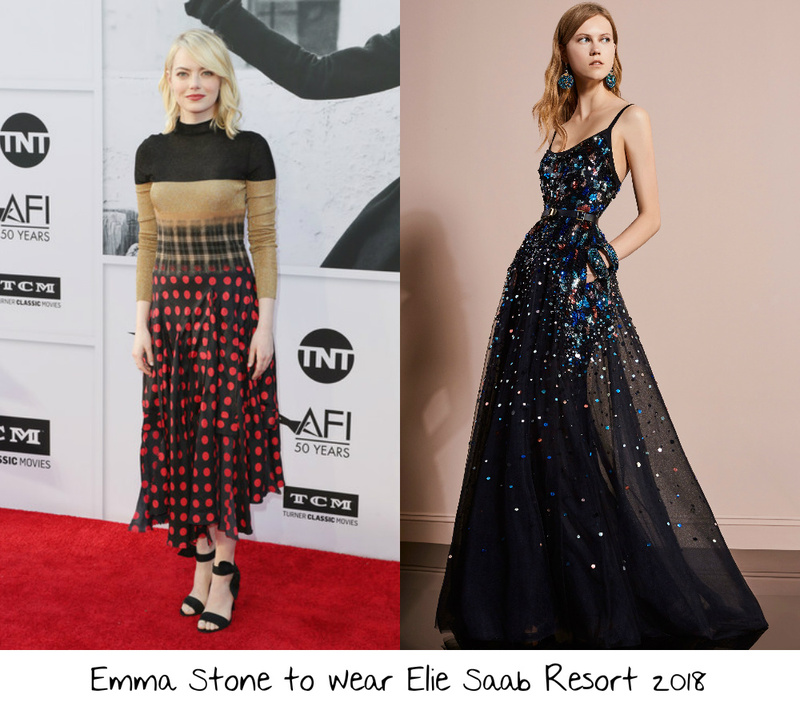 I think that Emma would be absolutely beautiful stepping out on the red carpet at the gala wearing this eye catching, glamorous multicolored sequin embroidered tulle Elie Saab Resort 2018 gown which features a round neckline, spaghetti straps, and a voluminous A-line tulle skirt. The gown would definitely catch the sun of Saint Tropez in it’s sequins and I can just picture it being a totally magical moment for Emma. With a loose updo, pink lip, lined eye, diamond drop earrings, and a pair of black sandals Emma will ensure that she has an absolutely beautiful moment. Kate Hudson attended the 2015 Leonardo DiCaprio Foundation gala in Saint Tropez wearing an edgy, moody, yet breezy Julien Macdonald gown and she is expected to attend again this year. Kate is one of my favorite ladies to see on the red carpet because of how she meshes her bohemian personality and high glamour. 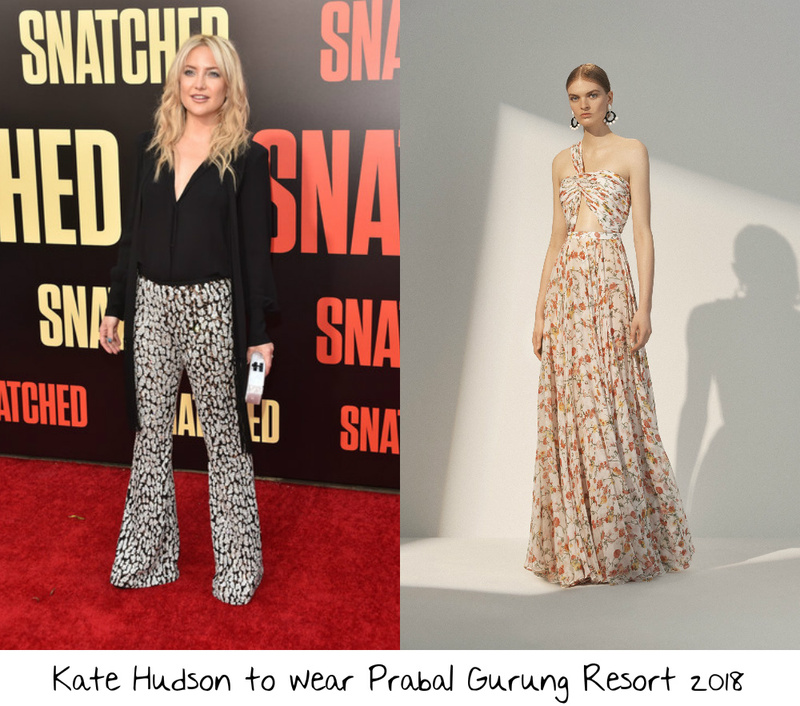 For this event I went with another chic and breezy gown for Kate to wear with this amazing orange and yellow floral printed Prabal Gurung Resort 2018 chiffon gown which features a one shoulder design and a pleated design. The gown is light and breezy and totally fits Kate’s love of bohemian glamour. This Prabal collection is one of my favorites from the designer, maybe ever, and I think that Kate would definitely be the perfect person to really make this gown come to life on the red carpet. Loose waves, sun-kissed makeup, orange clutch, gold set diamond drop earrings, and a pair of strappy gold sandals would perfectly round out this look. Marion Cotillard starred alongside Leo in Inception and has been a huge supporter of his foundation. Marion attended the inaugural Saint Tropez gala back in 2014, and was a guest in 2015. We are expecting to see her at the gala again this year. We have seen Marion working on finding her footing now that she is free from her Dior contract and I am actually really excited to see what she will bring to the red carpet at the Leonardo DiCaprio Foundation’s Saint Tropez Gala. Regular readers will know that this white and silver sequined and feathered Chanel Spring 2017 Couture gown is one that I really want to see on a red carpet, and I will continue to post it until it is worn. Now that Marion is free of her Dior contract I would love to see her wear more Chanel. I think that she has the look for the brand and she didn’t get a chance to really wear the brand before she signed her Dior contract. This gown seems like the grown up version of the Chanel cocktail ensemble that Marion wore to the 2008 BAFTA Awards, when she first burst onto the fashion scene. It would be a great moment to see Marion kinda come full circle almost 10 years later. With a sleek, side-parted low bun, Chopard diamond cluster earrings, lined eye, red lip, and a pair of silver sandals Marion will definitely win the red carpet with this look. I absolutely adore Penelope Cruz on the red carpet and I cannot wait to see what she will bring to the red carpet at the Leonardo DiCaprio Foundation gala later this month. I was trying to find any connection and aside being seated next to her at an Armani Prive fashion show in 2007 and attending some of the same awards shows there doesn’t seem to be a direct connection between Penelope and Leo. It doesn’t really matter as I know Penelope is a big supporter of the environment. I had a hard time picking the right gown for Penelope to wear on the red carpet at this event, but I ultimately decided on this bold peacock blue Marchesa Resort 2018 silk Mikado inspired column gown which features a strapless neckline, a ruffle back bow draped skirt, and a full length silhouette. I think that while this look isn’t boundary pushing that with the bold color and the glamorous silhouette would make this an absolutely beautiful moment for Penelope. With the setting on the coast of Saint Tropez over looking the French Riviera I always expect bright colors and breezy designs. While this gown is more structured, the color makes it perfect for Penelope to wear in this setting. I would ensure that this is a beautiful moment by finishing the look with a statement diamond necklace, sleek updo, smokey eye, and a pair of silver sandals. Finishing out this set of wishes is the beautiful Princess Charlene of Monaco who may or may not accompany her husband Prince Albert to this years gala. Princess Charlene is definitely a couture aficionado with friends at Chanel, Armani, and Dior. Most of her formal gowns that she wears anymore come courtesy of Dior and I would imagine that would be the case at the Leonardo DiCaprio Foundation gala later this month. 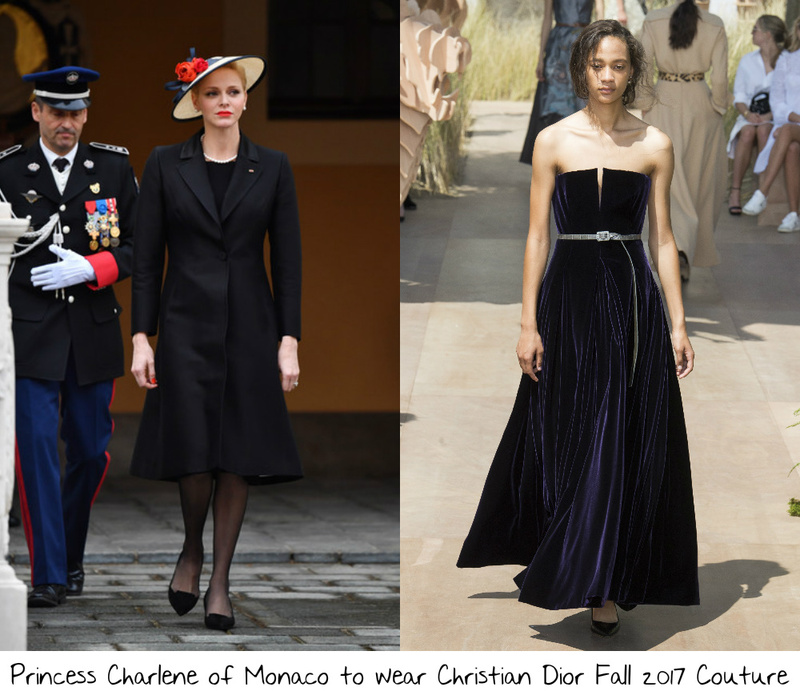 I was not the biggest fan of the Christian Dior Fall 2017 Couture collection but I am rather obsessed with this purple velvet strapless, a-line gown with a structured strapless neckline and I do think that the Monégasque royal would look absolutely lovely wearing this gown on the red carpet at this event. We don’t often seen Princess Charlene out and about, but this would be a perfect opportunity to see her showcase her very elegant sense of style. With a pair of black pumps, romantic updo, diamond necklace, and a red lip there would be no doubt that this look would be perfectly royal. Erdem x H&M: The Most Exciting Collaboration Yet?